My friend Chelley is back again with another product to sample and (maybe) fall in love with! You might remember her with the hookup for the Jamberry review I did back in during the holiday season, but she recently hit me up with a new product that will correspond with my fitness journey! She gave me the option of choosing three hydration “stiks” from M. networks that will help promote health and wellness: an anti-oxidant/anti-inflammatory stik (Core AO); an energy stik (Go); and an appetite control stik (Trim). Since I’m always grazing and looking to snack, I figured the Trim Stik would be the best choice to try. Trim is a delicious strawberry kiwi flavored powder that you pop into 16-20 ounces of chilled water 30 minutes before a meal, up to two times a day. 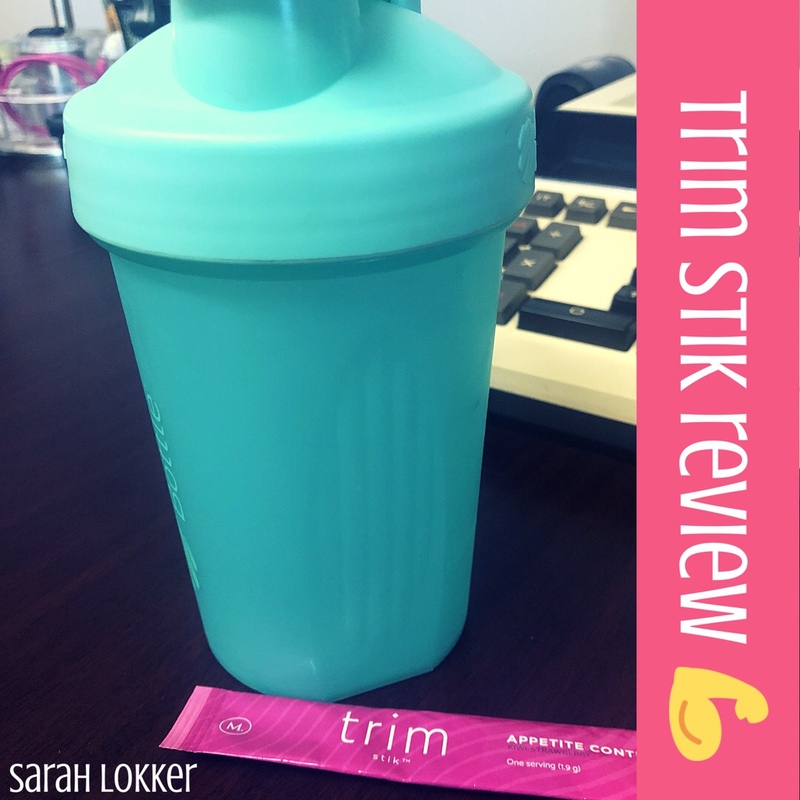 Each Trim Stik is 0 calories, which I am obsessed with because I always feel guilty about drinking my calories in a day so I mainly resort to plain old water, which can get boring real quick. While doing some research, Trim Stiks claim to help curb your appetite while boosting thermogenic activity in the body. I wish I took the time to look up what ‘thermogenic’ meant before using it, because I think it would have changed my first impressions on the product! After finishing the Trim Stik, I noticed that my tongue had a ‘funny’ sensation, almost being described as numbing. I use all these terms loosely because while talking to Chelley, she explained that the Trim Stiks have black pepper extract in them, which would explain the heat component I was feeling. The black pepper extract also made me feel a little nauseous immediately after, but I was fine within 10 minutes. Since the black pepper didn’t sit that well with me, she recommended trying it with a higher amount of water or only using half a stik per 20 ounce serving. She also noted that every person reacts to it differently, so play around with the water dosage and see what works best for you. I had eaten lunch roughly half an hour after finishing the Trim Stik, and I did notice that I felt more full after eating. I meal prepped chicken fajita with quinoa and grilled pepper and onions and I felt more content after eating it compared to not using the Trim Stik. I think it’s hard to tell how well these work on a three day sample especially because I didn’t use them continuously for three days. Rather, I used them for two, forgot the third one and then used it again three days later…. but I could see how they could help with appetite control with an extended usage. Chelley was awesome enough to send me another sample because I botched the first trial and I’m anxious to try it with different water ounces to see if I don’t notice as much heat! I’m someone who loves the idea of supplements or enhancements without the commitment of caloric intake. There’s a bunch of hydration sticks that enhance various aspects of your life, including one to boost your mood and something that helps with getting more sh!t done. The convenience of throwing this in a bottle of water (that I always have with me) makes it even easier and there’s no excuses. If you’re interested in testing out any of M Global’s stiks, hit up Chelley on her Facebook page and check out her new website. This entry was posted in fitness and tagged #blogger, bbloggers, be healthy, beast mode, beauty blog, blog chat, blogger girl, blogger life, blogger lovin, blogger style, bloggers, blogging, blogging gals, blogging tips, diet, fashion blog, fbloggers, fit chick, fit chicks, fit fam, fit foodie, fit girls, fit life, fitness journey, gainz, get strong, girls that lift, gym addict, gym life, gym rat, gym time, health, health and fitness, healthy, healthy lifestyle, healthy living, inspiration, life with sarah, lifestyle, lifestyle blog, live fully, m group, making it happen, motivated, muscle growth, never give up, on the blog, progress, sarah lokker, sarahhlokk, savvy blogging, squat, strength, the dedicated, train hard, train harder than me, trim stik, weight loss, weight loss journey, you can do it. Bookmark the permalink.